Once again, another strong performance from the under 7’s. The team played positive football to give them a 12-2 win. John Taylor scored 7 in the match, with six in the first half. After leading 7-0 at half time, the team took the foot off the gas a bit and conceded a couple of goals. 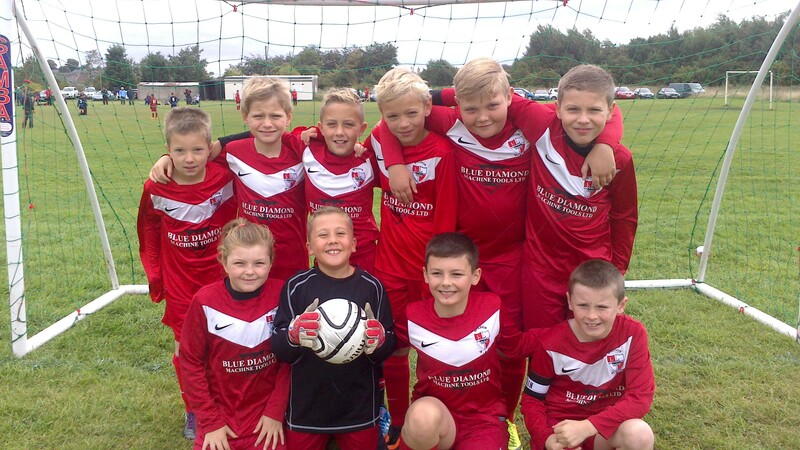 The Shildon Under 8’s second fixture of the season was at home to Seaton Carew Juniors. Both teams seemed to be evenly matched and some great football was played. An early goal from Seaton Carew spurred the Shildon boys on and Ben Moore soon put Shildon on the scoreboard. Jake Sharp, taking a turn in goal, made some great saves and the Shildon defence, Will White, James Plews and Ben Mortimer, was solid, with Ben going from strength to strength. After an equalizer from Jack Leighton, the first half ended with a score of 2 all. The weather got worse as the second half got underway, the Shildon boys seemed to struggle but fought on as Seaton Carew took more goals. The rest of the match just never seemed to go their way, despite the best efforts of Ben Moore, Jack Milner and Jack Leighton up front. As the final whistle went Shildon were beaten 6-2. For the friendly match, the full nine Shildon players took to the field and played incredibly well in a much more evenly paced game. However, Seaton Carew seemed to make more of their chances and they won 4-2. Callum Roe got the man of the match trophy for a cracking performance in defence. The extra training over the week for the team paid off at Darlington RA. The U9’s got their passing game going from the outset and went ahead in the first minute through Anthony Jary. Cole Layfield doubled the lead 2 minutes later. RA pulled one back in the 8th minute and would have scored another but a fine save from Jamie Donohue ended the threat, but Shildon had all the play from then on. Micheal Gaffney was strong on centre midfield and the defence pairing of Caytlyn Lawton and Kai Chadwick is getting better with each game and were in no mood to let anyone past. Micheal Gaffney restored the goal advantage a minute later before Cole Layfield bagged his second before half time. The second began with Shildon again dominating. Cole Layfield scored a wonderful free kick and Kian Dixon scored soon after. Cole Layfield’s 4th of the game rounded the game off well. The second game kicked off with Ashley Jardine showing some good passes and timely tackles. The game ended 3-1 to RA but nothing could take the shine off Shildon’s first match performance. Well done lads and lasses. Shildon advanced to the next round of the league cup after a hard fought win against a higher league team. Kicking off in poor weather conditions, Shildon withstood heavy pressure for the first 5mins and excellent goalkeeping from Owen Burke with 2 outstanding saves kept Hardwick at bay. 10 mins into the game Ellie Geary scored with a right foot shot after a good team effort down the right wing. 2mins later Kane Hopwood doubled the lead. A late hard tackle by Hardwick left Shildon’s Alex Foster injured and substituted. This disruption led to Hardwick pulling a goal back. At the start of the 2nd half, some excellent defending by Shildon kept the opposition frustrated, and after a disallowed goal from the home team, some neat play led to Kane Hopwood scoring again. Then a corner ball by Jacob to the edge of the box was controlled by James Rusby and volleyed into the bottom corner. The celebrations were short lived as Hardwick played the ball to the other end to score. A very good team effort by all the Shildon players meant a home win. Shildon produced a great performance first half and took the lead 3 – 1. Second half Callum Brown scored his hat trick from a great through ball by Callum Griffiths. Redcar were quick to come back but a tackle on the goal line resulted in Shildon’s keeper coming off injured, with defender Jack Mawson stepping into goal. However, he was quickly put under pressure by the away team, who went on to score two, making it 4-4. Nail biting tension as both teams fought to win the game, the win was anybody’s with end to end attacking. Harry Spark scored on his first game for shildon butRedcar took the win with a last minute Cantona esq chip straight over the keepers head. Shildon AFC Under 13s played the first game of the season at Dean Street , home of the 1st team . The opposition Fishburn Park are 3 leagues above, but that did not stop Shildon going all out. Shildon started the brightest and were on the attack almost immediately. Shildon came close to opening the scoring with Jack Mortimer shooting wide . The first 15 mins, Shildon were in control with shots raining on the away keeper, with Fishburn only having one shot, which was restricted to outside the 18 yard box, an easy save for Shildon keeper Niall Higham. Fishburn started to put a little more pressure on the defence but Shildon soaked it all up, with the centre back Cane Smith outstanding. Fishburn Park came into the game a bit more and some great saves by the Shildon keeper was needed. Eventually, the breakthrough came and Fishburn took the lead. The second half started and more of the same from Shildon with Tom Andelin and Adam Campbell playing some lovely 1-2s down the line. Unfortunately, Fishburn turned the screw a little bit more and then the goals came for them. Shildon played a great game and the two managers Gary Robinson and Dave Smith could not have asked for anything more than the team gave in terms of effort. The progress from the team has been fantastic and the Shildon community came to show their support as well.